A. Azizi, X. Zou, P. Ercius, Z. Zhang, A. L. Elias, N. Perea-Lopez, G. Stone, M. Terrones, B. I. Yakobson, N. Alem. (2014). 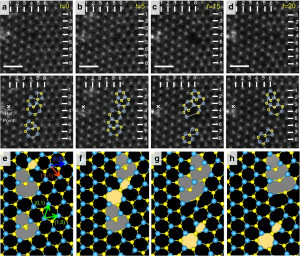 “Dislocation motion and grain boundary migration in two-dimensional tungsten disulphide“. 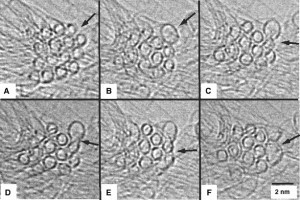 Nature Communications 5, 4867. M. Terrones, H. Terrones, F. Banhart, J. Charlier, P. M. Ajayan. (2000). 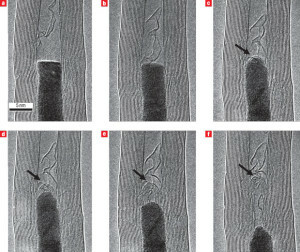 “Coalescence of single-walled carbon nanotubes“. Science 288, 1226-1229. X. Jia, M. Hofmann, V. Meunier, B. G. Sumpter, J. Campos-Delgado, J. M. Romo-Herrera, H. Son, Y. P. Hsieh, A. Reina, J. Kong, M. Terrones, M. S. Dresselhaus. (2009). 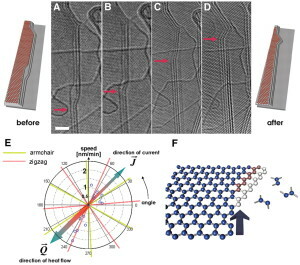 “Controlled formation of sharp zigzag and armchair edges in graphitic nanoribbons“. Science 323, 1701-1705. J. A. Rodríguez-Manzo, M. Terrones, H. Terrones, H. W. Kroto, L. Sun, F. Banhart. (2007). “In situ nucleation of carbon nanotubes by the injection of carbon atoms into metal particles“. Nature nanotechnology 2, 307-311.